Finally finished packing my closet after one week of slogging! I used to have my own table in the study room but I seldom use it as I am usually at the computer table in another room. Soon, my original table area became like a storage area where I pile my belongings - on the table, on the floor, on the chair. Over the years my mum nagged several times and I tried to tidy it up but this time it was the grand clearance. My parents went to buy me and my sister a closet each from Ikea and informed us that they are replacing our tables with it. And so, we proceed to start transferring items from our table to the floor and then to our new closet. Yes, closet. It's not even a cupboard meant for putting things. Haha. I threw away like 3/4 of my belongings while packing. Lots of useless stuff I've been hoarding over the years! Found several brand new items which I bought a long time back and left there and forgotten. Great find! Haha. So anyway, since I spent so much effort on it, I felt that I cannot let it go to waste! Must blog! I quite like my new storage space! It's a wonder how I managed to stuff all my belongings (even those stuff that I used to store in another rack) into this tiny closet. I used to have so many things stacked up! 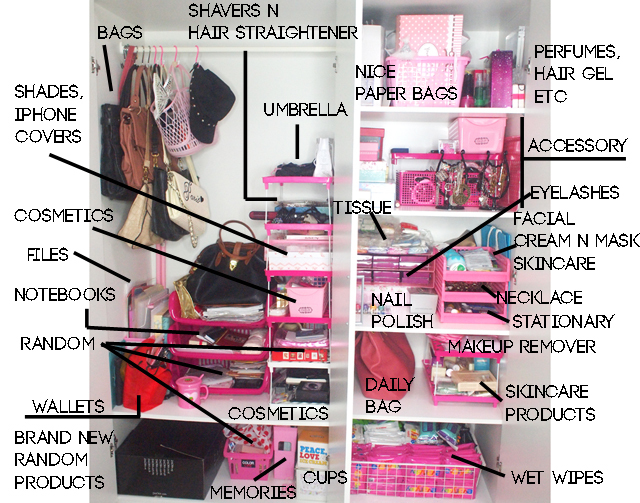 Top compartment: Paper bags, perfumes, gift sets, hair gel, etc. Things I seldom need to use, because this part is harder to reach. Haha. 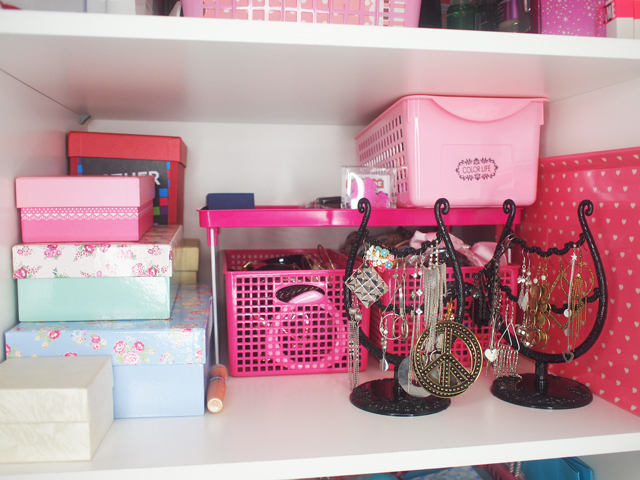 My favorite shelf - the accessory corner! 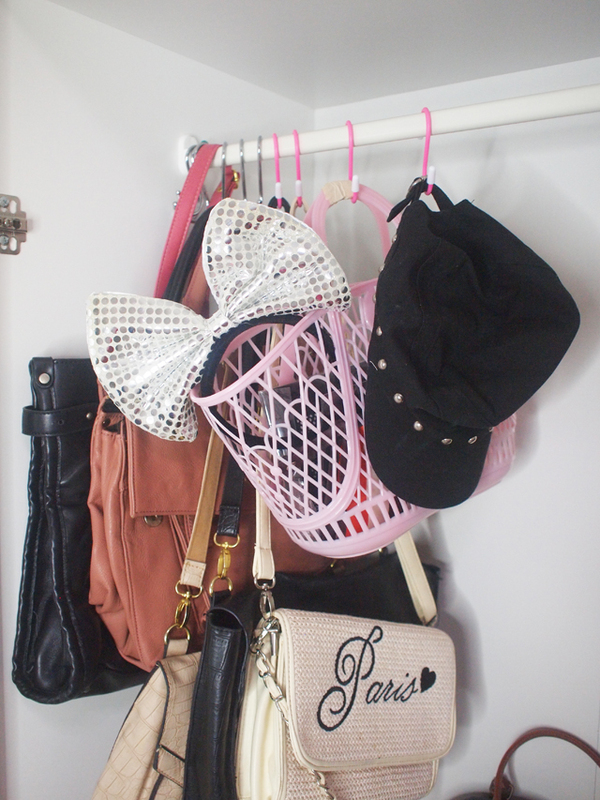 I need these items on a regular basis so everything is eye level :) Placed a 'rack' so that I make use of the space! 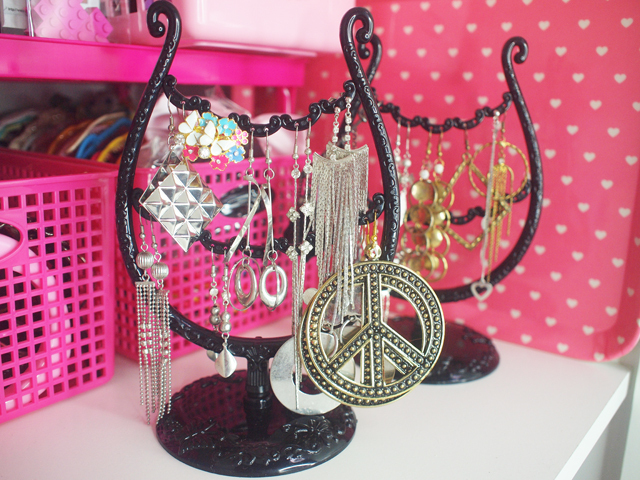 I bought these earring racks for $2 each at Daiso. Quite useful! 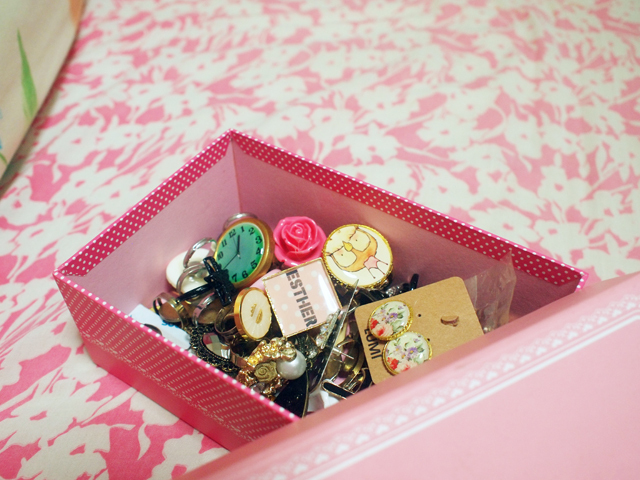 Totally love these three boxes I bought from Daiso too! The design is so pretty ^^ The pink one is for rings, green one is for necklaces and blue one is for nail polish. At the back that red box given to me from a previous event has an ESTHER label - It's for my hair accessories! The tiny box in front store some ear studs and non-dangly earrings. Some nail polishes in the blue box. I seldom use them because my manicuring skills are very lousy. Only use them when I am unable to slot a visit to the salon into my schedule. 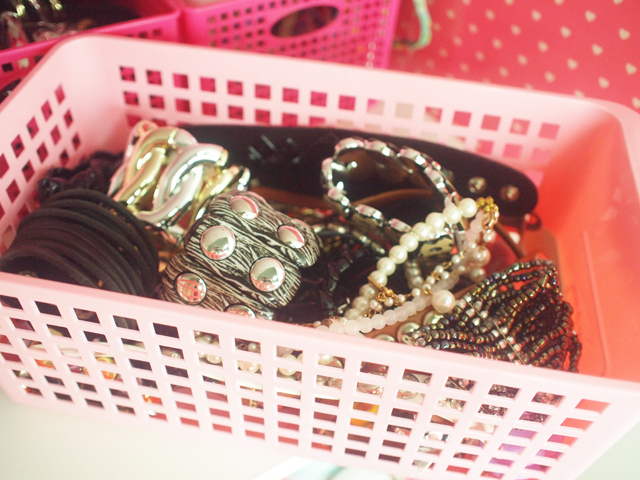 The two boxes below are for storing my bangles and headbands. Just need to pull them out of the 'rack' in order to see and select! The next level, I have these racks (originally for paper/file usage) to make use of the space. 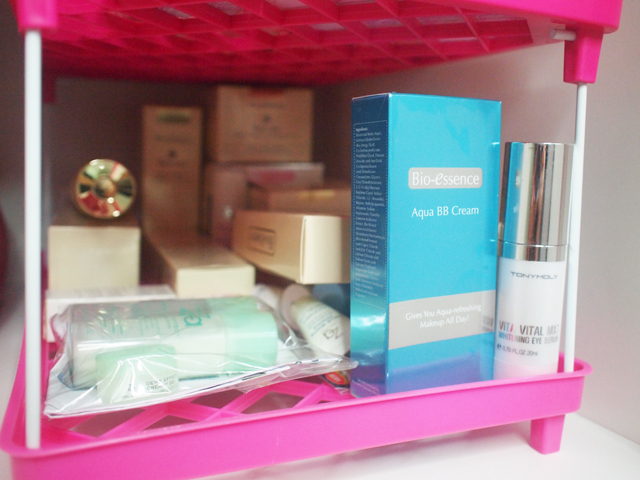 Skincare items on top. 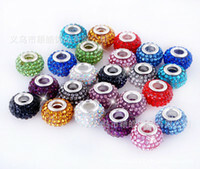 Chunky necklaces on 2nd rack. Other necklaces are in the green box as shown on the upper level earlier! Last rack are for the stationary and tech stuff like batteries. 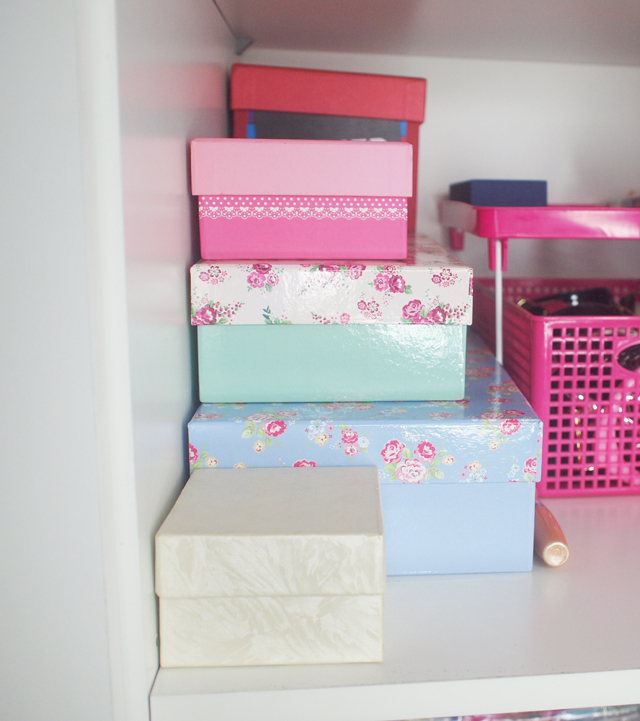 At the side, I placed tissues, lashes from Blink.sg (Purple boxes. These are the ones I use regularly and I used the file racks horizontally so that they are easy to slot out) and the pink floral box stores random lashes. A new pack of nail polish lays just there. Haha. Next level, I have my wet tissues and makeup remover wipes. Below that are the skin care products which I plan to use after finishing my current supply of products. 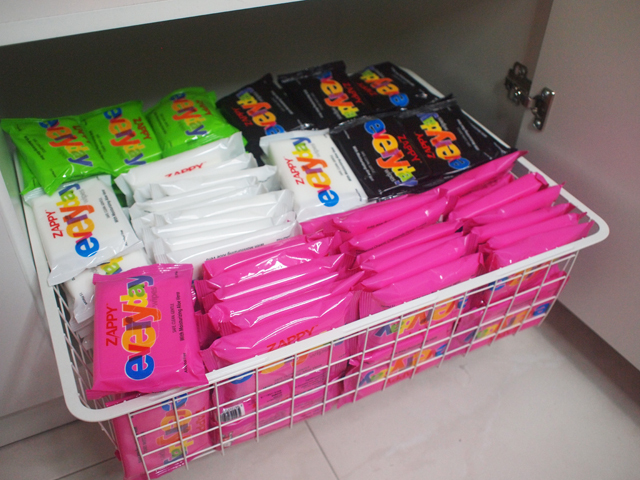 And the last shelf stores all my everyday wet wipes! I'm so happy that Zappy sponsored me this huge box of everyday wipes! I love the refreshing touch and cooling effect it has, especially on a warm day! The fragrance is lovely too. Very useful and I bring a pack out everyday! Lets continue to the left side of the closet! 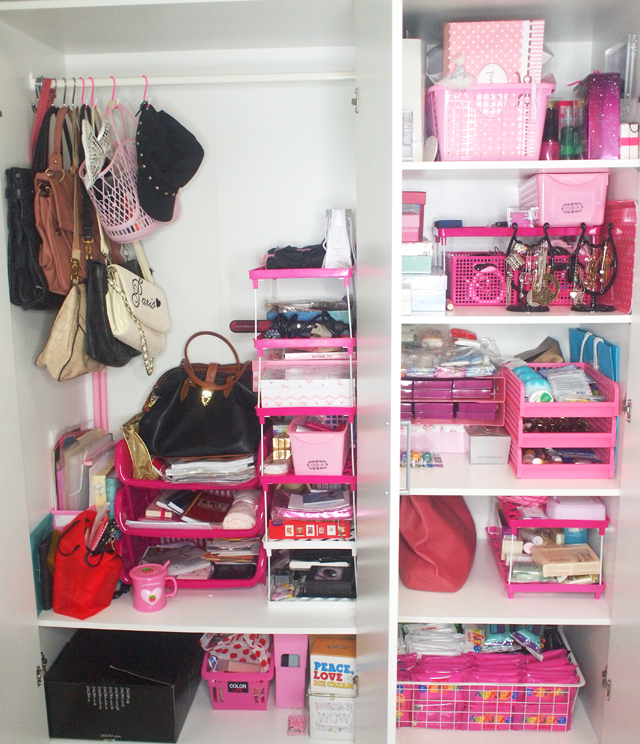 At first I was quite worried about this area because it has no shelving and I was afraid of wasting space. 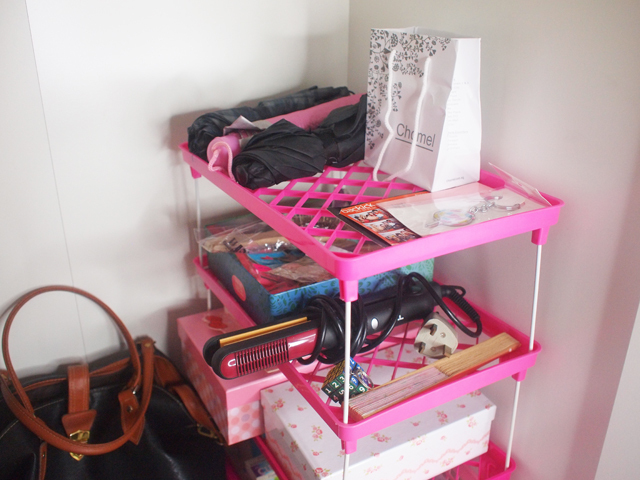 But I got some racks from Daiso and the problem is solved! Hung some bags just to fill up the space. Most of my bags are in another container. 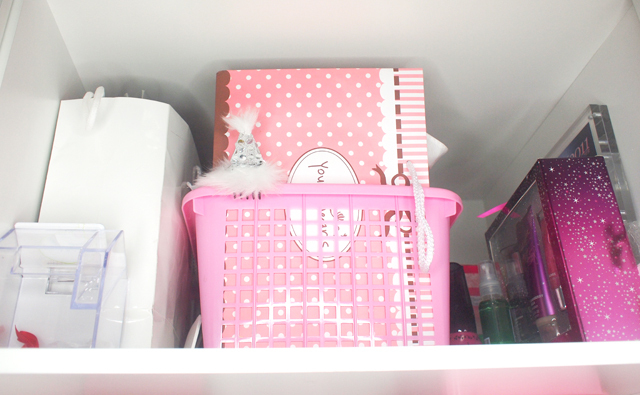 The pink basket holds some random stuff which I didn't know where to put. Racks again. 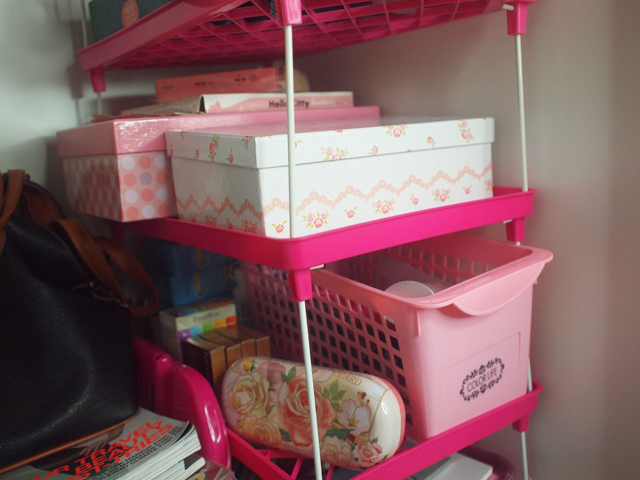 These from Daiso are really useful, but stacking it up high and putting heavy things are not recommended because it isn't exactly stable or strong. But for $2, what kind of standard do you expect? I'm quite satisfied with it! Umbrellas and random stuff on top. Then, shavers and hair straightener and a paper fan. Random, I know. The pink box stores new iphone covers I've yet to use and the white pretty box stores all my eye shades. 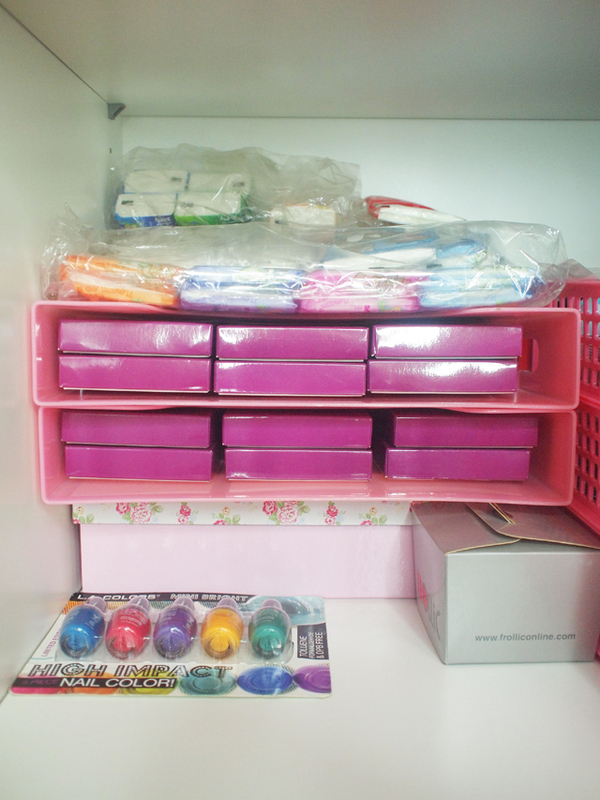 Next level, the pink container holds small cosmetic items like blushers, eyeliners, etc. At the side are contact lens solution, new contact lens, and a spectacle case from Papier Rever at Jipaban! These are cosmetic palettes which are quite heavy so I left them at the most bottom rack. At the middle of the closet, the top rack holds current magazines. 2nd racks are these notebooks and scheduler. Bottom rack are random stuffs. Beside the rack, I placed files and wallets! A random cup in front of the rack because I did not know where else I can place it. 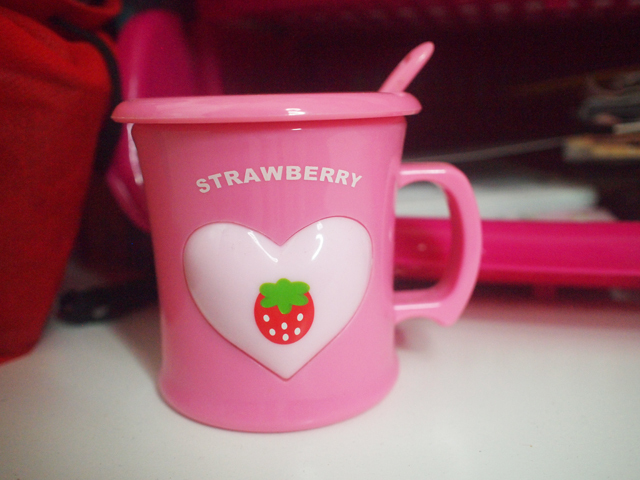 Below are random stuff which I didn't want to throw away, memorable items and nice cups which I have yet to use! I forgot what's in that brown box behind. Oh, I think I store canvas bags inside. 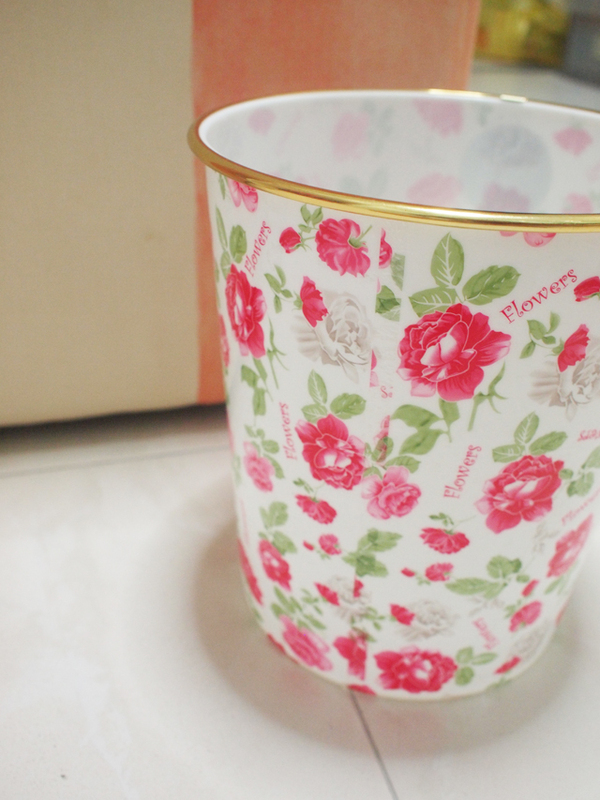 Lastly, my pretty floral dustbin from Daiso! 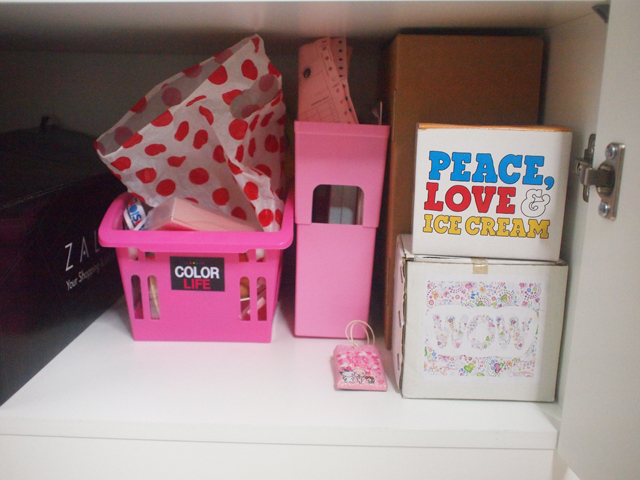 My whole closet is so Daiso-ish. Haha! 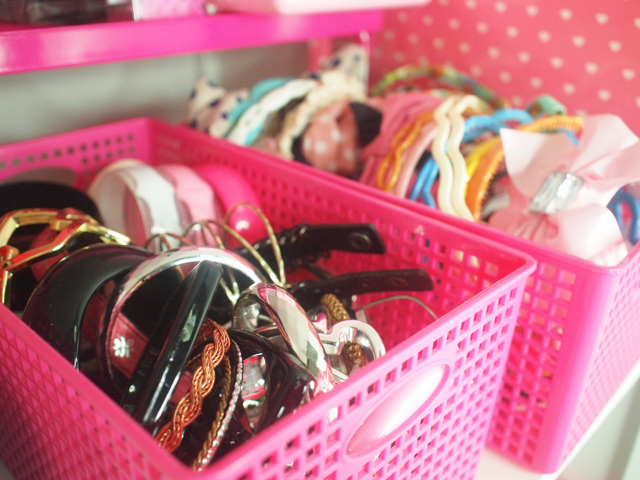 what a nicely organised storage! 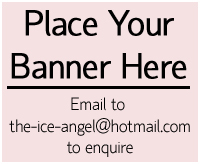 anyway would like to know where u work? 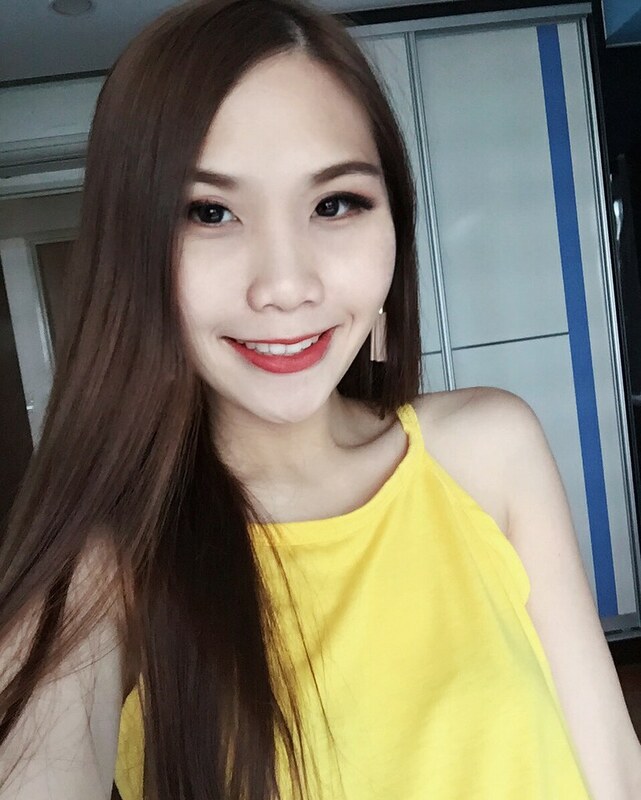 Hi Esther where to buy zappy. Everyday wipes?